Cooperative Housing International (CHI) is one of the eight sectoral organisations of the International Cooperative Alliance (ICA). CHI promotes cooperative housing as an economic and social solution to the problem of providing shelter. Housing coops come in many forms. Some coops are townhouses and small buildings with just a handful of units. Others are large apartment-style buildings with hundreds of units. Coops are different from private rental housing because the residents decide how the coop is operated. Every member gets a vote in approving annual budgets, electing directors and setting policies on the coop’s overall direction. CHI raises awareness about cooperative housing by promoting its successes on a global level. We facilitate networking opportunities among existing and upcoming cooperative leaders via panel discussions and symposiums. Highlighting good practices from around the globe and discussing key issues is ensuring that cooperative housing remains an innovative and flexible housing model that is adaptable to local housing needs. Through an active board of directors and dedicated staff, we deliver a relevant work program in harmony with the strategic objectives of the ICA. The board of directors meets twice annually and the executive committee meets virtually bi-monthly. CHI is not involved in the development of cooperative housing but through its international network, it provides links to technical expertise. The resources section of our website also includes useful tools and resources on topics ranging from governance to finance. You can search by topic and/or by country or simply scroll through the pages and pages of information. A collaboration with the CoHabitat Network is further widening CHI’s network with collaborative housing partners on every continent. CoHabitat Network’s digital platform is a wiki-inspired resource that provides detailed information on numerous collaborative housing initiatives around the world. As the Guidance Notes to the Cooperative Principles states, “Cooperatives are active in every sector of the global economy. A key distinguishing feature is that cooperatives create wealth for the many members of cooperatives who engage in cooperative businesses as service users, producers, independent business owners, consumers, and workers…” It is this defining feature that separates cooperative housing from market owner-occupier or investor-owned housing. Housing cooperatives are operated by and for the resident members and not for the purpose of personal or corporate profit. Their potential for creating thriving and caring communities is achieved through coexistence in a democratic habitat. 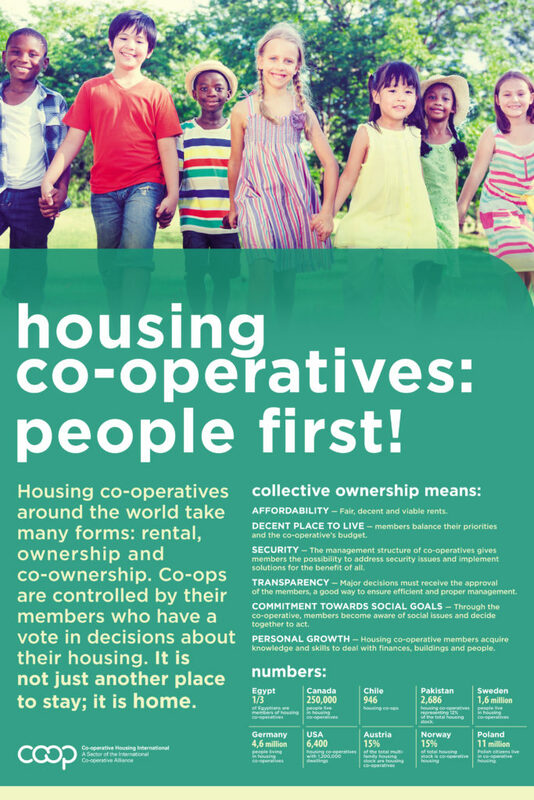 It is the job of Cooperative Housing International to raise awareness of the potential of housing co-ops as widely as possible. To find out more about cooperative housing you can read one of our many resources.